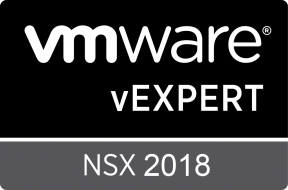 Currently, I’m working on a migration project where we are migrating VMs from a non-NSX legacy environment to a brand new NSX-enabled infrastructure. During the migration, I needed to apply NSX Security Tags in the destination environment. The tags needed to be applied based on the environment type e.g. Production and Development. And I thought; Yeah! PowerNSX is going to make my life more easier now. Unfortunately, I wasn’t able to connect to the NSX manager via PowerNSX. Even installed all of the latest updates and patches, but that didn’t solve the problem. It kept throwing error messages when I was trying to connect. As you can see in the print screen below. This might be a compatibility issue since I was connecting to an NSX Manager 6.2.5 version, and I’m not sure PowerNSX is compatible with this NSX version. If somebody has successfully used PowerNSX with this NSX version please let me know! Since I desperately needed to automate some things because of the amount of VMs in this environment I needed to think of something else. Create a script which talks to the API, yes, of course, that will do! So I created a script which was invoking the NSX Manager API via the native Powershell command: ”Invoke-Restmethod”. With this script, I was able to successfully logon to the NSX manager, doing API calls and pushing stuff to the NSX manager. In order to use this script you need to know the identifier of your security tag. You can find this by doing an API call to your NSX manager: /api/2.0/services/securitytags/tag. For example with Postman. Refer to Mark Brookfield’s his blogpost for a detailed explanation how to use Postman with the VMware NSX API. Please feel free to use the script, and adjust it to your own needs. If you have any questions don’t hesitate to reach out to me!